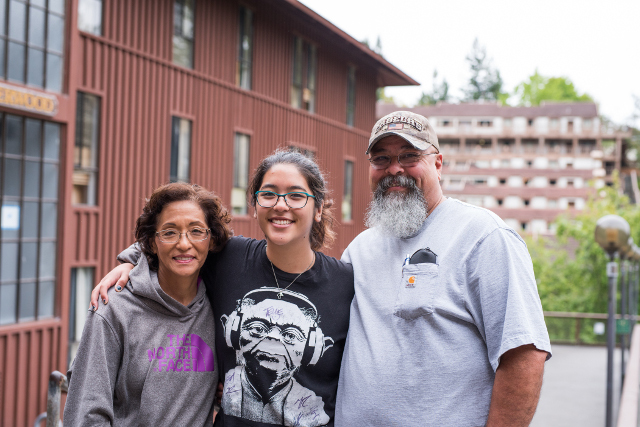 Humboldt State is welcoming back students for the Fall Semester. Move-in Day.August 21 is the first day of classes. The expected incoming freshmen class is 1,188 students, and initial demographic data shows that 40 percent hail from Los Angeles, 52 percent are low-income and 59 percent are first-generation students. For a gallery of photos from Move-in Day, click here. Most new freshmen move in to the HSU Residence Halls from 7 a.m. to 6 p.m. Transfer and returning students move-in after 6 p.m. that same day through Monday, August 21. Thursday, August 17, 8:30-9:30 a.m.
HSU President Lisa Rossbacher will deliver remarks to HSU employees and community guests in the Van Duzer Theatre. President Rossbacher will discuss the University’s big goals and give updates on the Strategic Plan, Graduation Initiative 2025, and WASC accreditation. Friday, August 18, 10 to 11:50 a.m.
Freshmen and their families learn about campus and community organizations that will have tables on the UC Quad. Visit the HSU Events Calendar for more information and events. Please note that media are not allowed to enter, or interview students, inside the residence halls. Traffic flow on campus will be affected during the week of Aug. 17. For more information or assistance, contact HSUNews & Information at (707) 826-3390.